"2000 lbs. Holding Force Gate Lock"
- Select Function: GL1-FL (Standard Fail Locked), GL1-FS (Standard Fail Safe), GL1-FLM (Monitored Fail Locked), GL1-FSM (Monitored Fail Safe), GMC (Gate Lock Mortise Cylinder). - Delivery: The Securitron GL1-FL is In Stock. Please allow 3-4 days' lead time on all other functions. Electromechanical Gate Solution Offers One Ton of Holding Power! The heavy duty GL1 Electromechanical Gate Lock provides weather-resistant access control for a wide range of gate applications. The GL1 provides 2000lbs of holding force for electrical and manually operated indoor or outdoor gates where preload is a concern. Ideal for swinging or sliding vehicle, pedestrian, or stock gate access control. - 2000 lbs. holding force. - Operates under preload up to 100 lbs. - Automatic dual voltage - no field adjustment required. 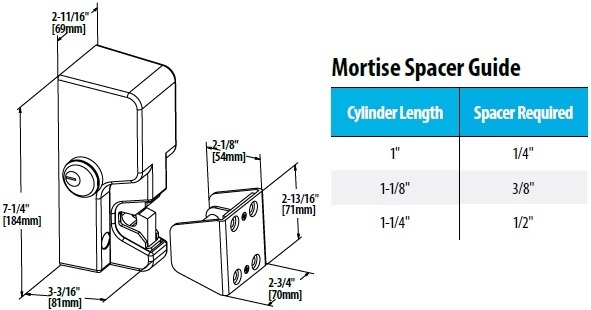 - Accepts a standard mortise cylinder with Adams Rite MS cam for manual key override (not included). - Self-aligning receiver (+/-1/2" horizontally) helps compensate for gate misalignment and sag. - Tamper resistant cast housing. - Optional latch status monitor. - Hardware accessories available to configure any opening. See "Related Items" above. Delivery: The Securitron GL1-FL is in stock and available to ship. Please allow 3-4 business day lead time on other functions.